You see all sorts at Disney World! I guess that the boys are pretty excited about this week-each morning when we go to wake them up, they surprisingly have their clothes on. It has taken us a few days but we have finally realized that they are sleeping in their clothes I guess it does save some time in the mornings so not a problem with me. The girls were a bit more difficult to wake up this morning. Once they were up it took a while for me to fix their hair before sending them downstairs to eat. This left me about 30 minutes to get ready but luckily for Robby, this was not a problem. I was ready in time to have my Big Texas cinnamon roll and to watch Robby pack our lunches. We were out the door this morning again at 8 and were soon at the parking lot walking to the monorail. But the monorail wasn’t working this morning so we were able to ride the boat across the 7 Seas Lagoon. The boys really love the monorial but I am a bit partial to the boat. Whitman wasn’t too fond of the boat and wanted for me to “get off back there.” Once we were on solid ground and moving again, he was just fine. This mroning we fought the crowds to get to Peter Pan-really though there weren’t too many crowds going to Peter Pan. We were on a quest to do anything that we haven’t yet done and Peter Pan was the one. It had been updated since we had been on it so we even rode it twice. Then we rode the carousel and worked on trying to take the sword out of the stone. We were unsuccessful at this but one of Cinderella’s stepsisters tried to coach Anderson to help him with the sword-it did not work. After the sword attempts, we rode the teacups. I kept my eyes on Whitman so I didn’t get too dizzy but I do believe that Nonna’s teacup was spinning faster than mine. Robby then had Fastpasses to the Tomorrowland Speedway. That is always fun and a little bit of a scenic ride. Keaton could not get over that the car drove itself. Next up was jumping in line for the Astro Orbiter. While we were riding that ride, we spotted Pops and he was eating something-a chocolate covered banana. We asked him about it when we were off of the ride and he said that since he didn’t get to ride, he deserved a snack. Winnie the Pooh was the next ride that we rode. Then we ventured over to Space Mountain for Campbell’s first ride there. Last time we were at Silver Dollar City, Campbell would break into the ugly cry on any roller coaster but not at the most magical place on earth. She did great-I had my hand on her shoulder until she brushed my hand off. We had one more set of passes to ride it so Reagan, Anderson and Graham did that ride. While they were riding, Robby, Campbell, Whitman and Keaton went to save a table for us to eat our lunch. We ate in Tomorrowland-for most lunches, nutella was on the Dennie menu today. The other day we didn’t stop and play on the Dumbo playground so that was what we did after lunch. The little ones loved playing on the playground but you can tell that my big 3 are getting too big to play on the playground. While we were there, I did have to run Keaton and Campbell to the bathroom and goodness gracious, it was halfway across the park! When we returned, we all boarded Dumbo and rode one last time. Then we stopped for ice cream sundaes. They were delicious and it hit the spot because the perfectly wonderful weather we had experienced during the morning turned into sunny and hot! While eating the ice cream, we saw Cinderella’s stepmother and stepsisters and jumped in line to see them. Everyone but Whitman was with me in line and they all walked up to them and I guess no one said anything. The stepmother asked “hablas ingles?” to my silent kids-I am not sure if she was joking or not but I started laughing. 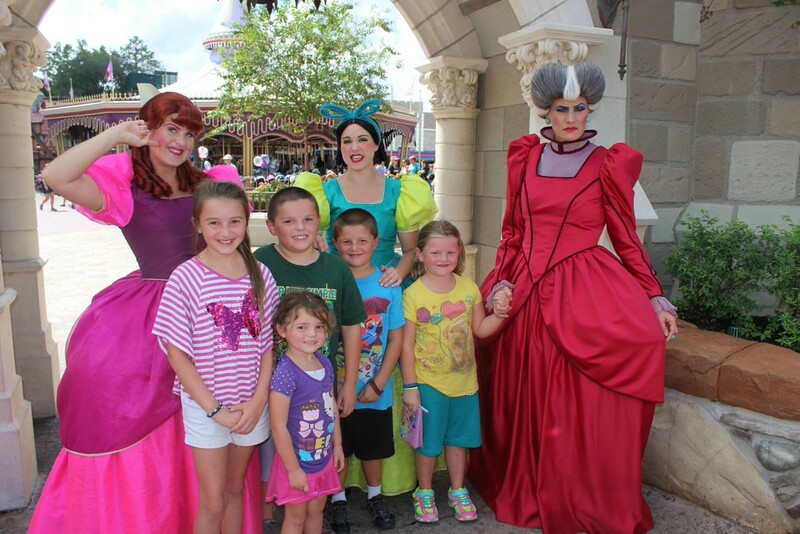 The stepsisters were pretty rowdy and one of them asked the kids if they lived in a show since there were so many of them. My quick thinking Reagan said “no, but it smells like one.” This caused one of the stepsisters to roll on the ground laughing! The next stop of the day was the Jungle Cruise. My favorite part was when the boat captain told everyone to get down and Campbell bounded out of her seat trying to get down. I have a picture from last time and the kids were all bending down too! After that ride, Nonna and Pops went to do a bit of shopping and we headed to the Aladdin ride. We rode it once and then sat down for a bit to have some Dole Whip. Robby was really hoping to find the orange juice slushes (an absolute favorite of his) but didn’t see those until a few minutes later. We then lucked into pretty perfect spots for a parade. The kids were able to see wonderfully and Whitman sat perfectly still in Anderson’s lap during the entire parade. We do not always to get see parades but today we sat through the whole thing. It was a good one-lots of princesses and even ended with Mickey and Minnie. At one point though I was holding Keaton and there was some type of big dragon. She wanted me to put her down and stand in front of her! After it when by she was perfectly happy again and we all enjoyed the parade. After the parade, we hopped on Aladdin again and then went to find Nonna and Pops. On the way there we were trapped by the parade again but soon met up with them. We followed the crowd to the monorail and were soon back at the car. Once we made it home, we unloaded and did a bit of repacking. Whitman was halfway asleep when I laid him down from the car ride home but didn’t stay asleep very long. But he was asleep long enough for us to sneak back out for a night out. Robby asked the kids who would want to go back out with us and Reagan and Anderson were the only ones who took us up on our adventure. Graham would have enjoyed going with us but I think that he was pretty tired. Campbell and Keaton could only think about swimming which they all 3 did as soon as we walked out the door. Nonna woke Whitman up and he was able to swim for a bit too. They had supper and even made cookies while awaiting for our arrival back to the home. We had no stroller, no bags, no nothing tonight except for our fast walking kids and we covered some ground. This was the night of the Halloween party which we were not attending so we had to be exiting the park by 7. There were some monorail issues so we had to wait quite a while for a ride to the park but once we were on the ground we moved pretty quickly. The first ride that we did was Buzz and then we did the Stitch’s Great Escape. The kids had not done that and it was neat but not the most wonderful thing in the world. We will have to do it on Friday for Graham though and that is fine. It was quite interesting watching everyone pour into the park wearing their elaborate Halloween costumes. I really wanted to start running up to people asking for their autographs but I know that would have embarrassed the heck out of Reagan-we probably should have done it. Big Thunder and Splash Mountains were next. The lines were fairly short so we were able to ride those before being shoo-ed out of the park since we didn’t have on the party wristbands. The train station looked all spooky and which was neat to see. Again the monorail seemed to take a while but we soon made it via the resort monorail. Then it was on the tram to our car-which we couldn’t find. We were in the right parking lot but just had to look a little bit. It is surprising how many big white vans there are in the Disney World parking lots. After finding our car, Robby ran into the grocery store to pick up a few things while the kids watched Frozen and I worked feverishly on the blog! Once at home, Nonna had saved us some cookies and all of the kids were delighted to see us. My Keaton was pretty much exhausted and asked a few times for us to go to bed. They all went to bed easily and then I had to break it to Pops that we were going to be leaving again tomorrow at 8! He told me that we were not on vacation and should just leave at 10 in the morning. I then told him that he could find his own ride and I would see him at 10-he will be ready bright and early in the morning since he doesn’t want to miss a thing!